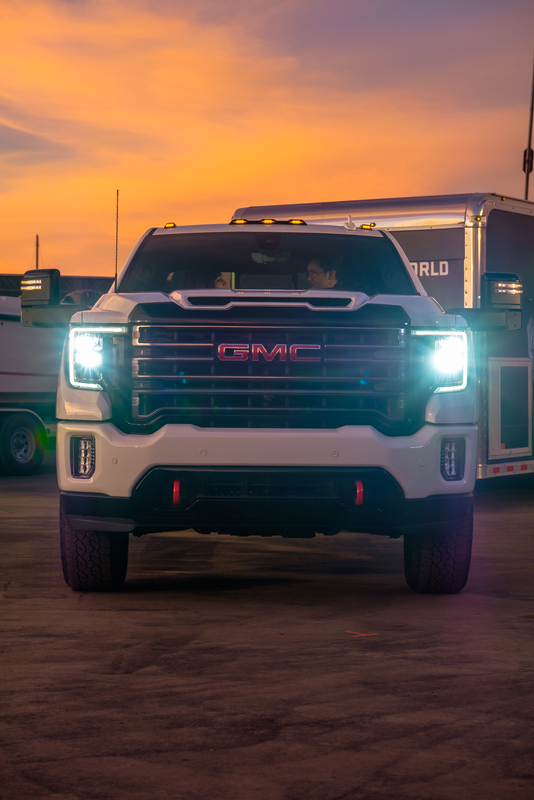 Just a few hours ago GMC revealed their all-new HD lineup on the shores of sunny San Diego, and they opened up the event in a big way, a very BIG way. 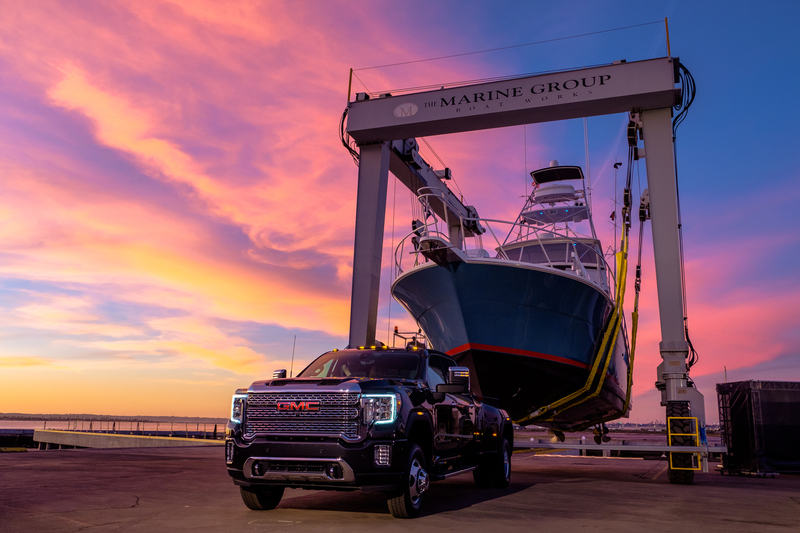 Since towing is one of the main focuses of their HD line, they decided to roll out the 3500 HD Denali with a ridiculous 225,000 pounds hooked up behind it, in the form of an 80-foot boat and travel lift. For those wondering, that’s a good deal more than the Space Shuttle. 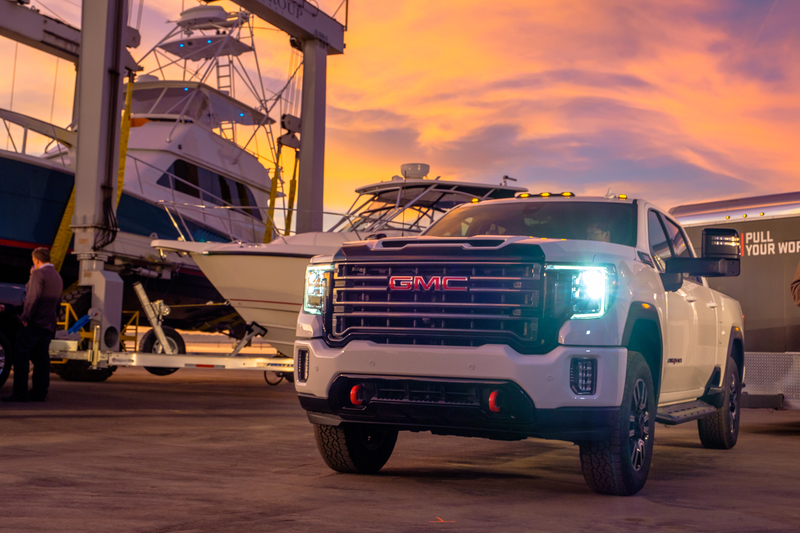 Although that is clearly well in excess of the towing limits, which will be more than 30,000 pounds, it does prove the durability and amazing capability of the platform. Yet there is more to see than just big power and payload numbers this year. That’s because the HD line now boasts an entirely new AT4 segment, improving the product’s off-road prowess without sacrificing its utility. If you read any of the AT4 descriptions online, you’ll likely be bored with them before you reach the end of the first paragraph. That’s because for some reason they start the description with all the trim and color changes instead of the real meat and potatoes of the matter, which is why we’re going to skip to the important issue first: capability. 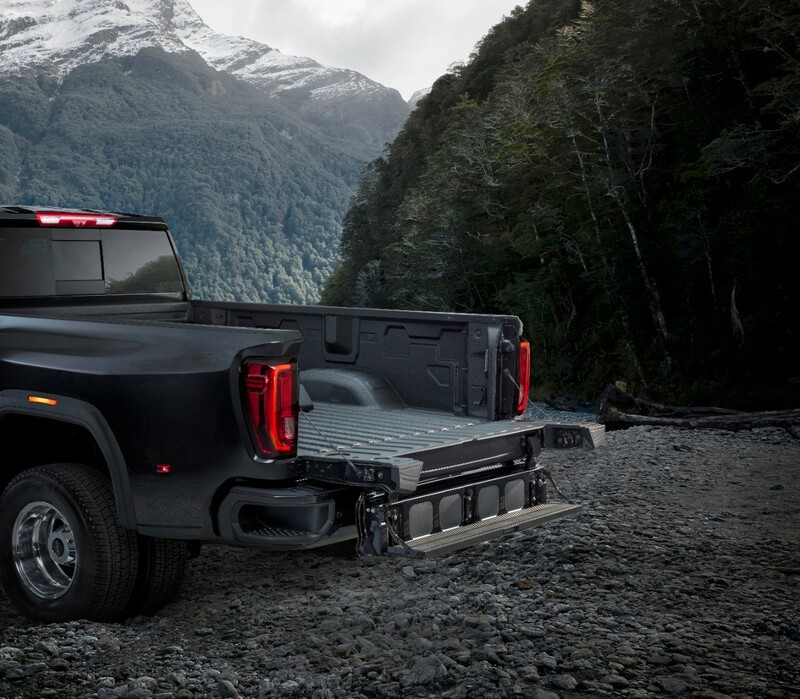 The 2020 Sierra Heavy Duty AT4 comes equipped with an all-new off-road suspension, with Rancho shocks designed in conjunction with GMC to accommodate the platform’s full towing capabilities, while also improving ride comfort and dirt road performance. 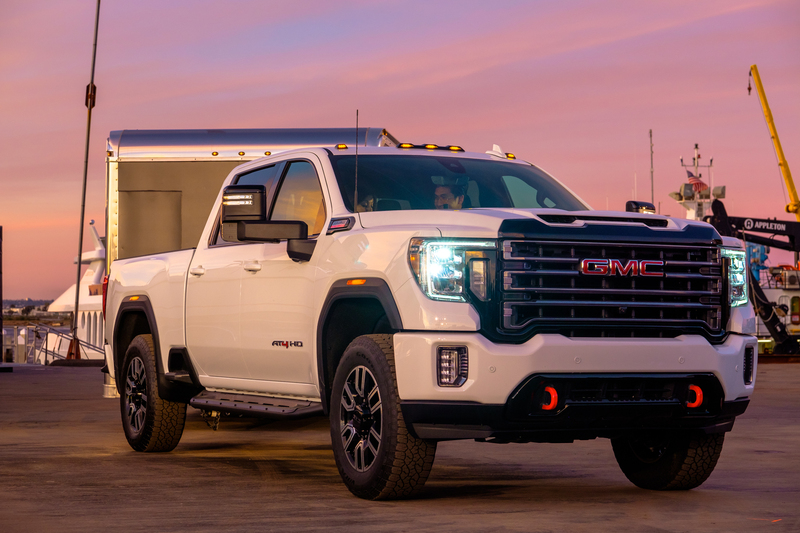 Unlike the other AT4 packages in GMC’s lineup, the HD will not receive a 2-inch lift via the suspension, but it will still come standard with over 10 inches of ground clearance, thanks to a relocated DEF tank and 18-inch wheels wrapped with Michelin all-terrain tires. In case that clearance isn’t enough, the AT4 will pack a set of skid plates, although the one present at the launch did not appear to have them. For trail use and low-traction scenarios, the AT4 will come equipped with a traction select system including an off-road specific function. Hill descent control will also be available, as will a segment-exclusive 15-inch diagonal Head-Up Display with Off-Road Inclinometer. 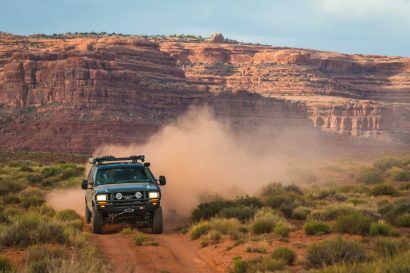 Then there’s the rear locking differential, which will give this truck the ability to navigate uneven or difficult terrain even when the going gets rough. Of course, at that stage, you’ll likely be in hot water due to the HD Sierra’s size, which is why they’ve included a surround vision camera system for self-spotting and trail visibility. This provides a real-time 360-degree view of the vehicle, making it possible to thread the needle on a difficult obstacle. Now we get to all those unique accents and appearance package options, which admittedly, add a lot to the vehicle’s character. 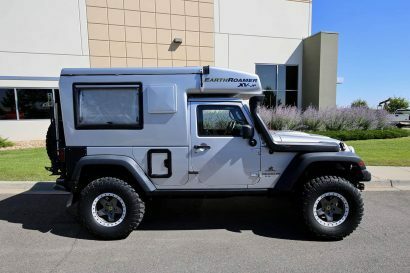 For starters, the chrome accents and components are now black, or at least black chrome, with small splashes of red on accessories like the frame mounted tow hooks up front. The front and rear bumpers are matched in body color paint, the headlights have received an obvious and contemporary update, and the grill adds to the modern and aggressive look. Inside you’ll find a darkened trim package with textured aluminum accents on the steering wheel, center stack, and sill plate. The leather seating is finished in Jet Black with Kalahari inserts, along with embroidered AT4 badging on the headrests. Buyers will also find all-weather floor liners to keep the interior tidy while in the field. 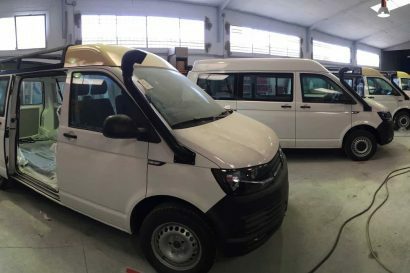 The AT4 will be available on 2500 and 3500 models with single rear wheels, but not on the dually models, which is to be expected. I mean, who really wants to off-road a dually? 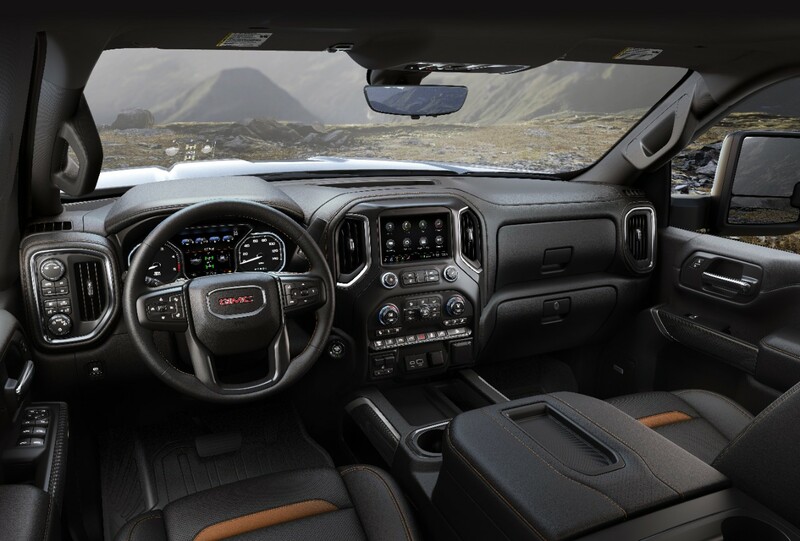 It will pack their 6.6L Duramax turbo-diesel, capable of pumping out 445 horsepower and 910 pound-feet of torque, paired to the all-new 10-speed automatic transmission. This transmission is a segment exclusive option that gives the HD line closer gear spacing to allow the engine to operate in an optimal range at all times. In other words, it’s less affected by terrain and load conditions. The result is a towing capacity we’re being told is ” well in excess of 30,000 pounds,” though specifics have not been named. So what else is new on the heavy-duty line? For starters, these trucks will receive a longer wheelbase, a taller hood, and an overall lift in height. 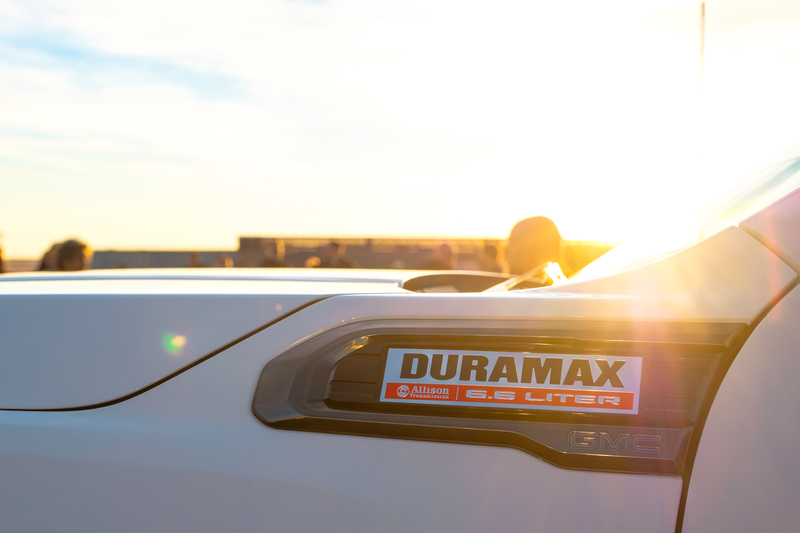 The grill has been enlarged for additional airflow, which works together with the functional hood scoop to feed the Duramax’s rather robust cooling system. Despite the overall lift, they did manage to drop the bed height a full inch, making it easier to access in all conditions. This will be especially useful for those of us with motorcycles, or who haul fifth-wheels. Segment-exclusive, bed-side steps make it easier to access the front of the truck bed, while a new 120-volt power outlet can feed the hungriest of tools. Finally, the HD line will now sport the MultiPro tailgate on all trim levels, providing six different functions for owners. These include various step functions that allow you to climb into the bed via stairs, a work station, and load stops to help prevent equipment from sliding out while the tailgate is down. You still need to strap and secure your load though. Then there are the seriously cool towing and technology packages integrated into these trucks, including some of the craziest camera views I have ever seen. 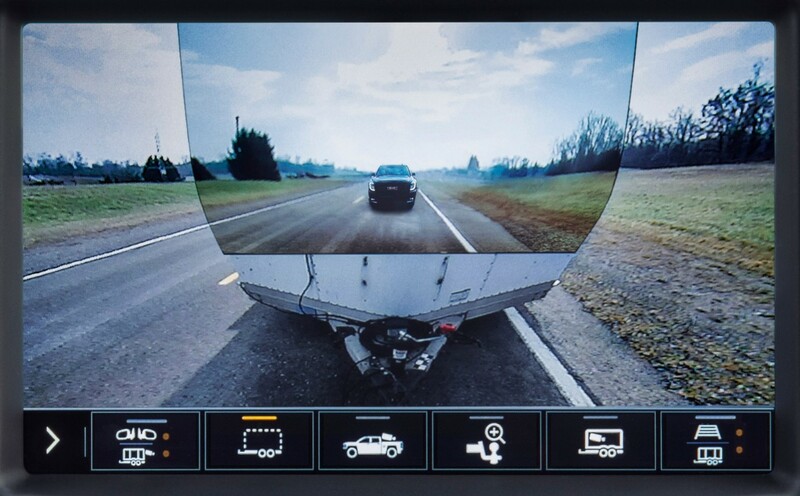 There are 15 camera angles in all, but just take a look at the transparent trailer option above, which fills in the road behind you allowing you to see past the trailer like it almost wasn’t there. Other cool angles include a birds-eye view and even an interior view of the trailer itself. Of course, there’s plenty more towing features than just cameras on this truck. It packs an integrated brake controller, anti-sway technology, a stronger frame, auto-grade, diesel exhaust braking, and Digital Variable Steering Assist that optimizes power steering according to driving scenarios. Although it will be a while longer before we can get behind the wheel of one of these heavy-duty trucks, we couldn’t be more excited for their release, especially the AT4. It marks GM’s continued dedication to the off-road space through a range of options for various needs. For those looking for the maximum off-road capability, their Bison will fit the bill. 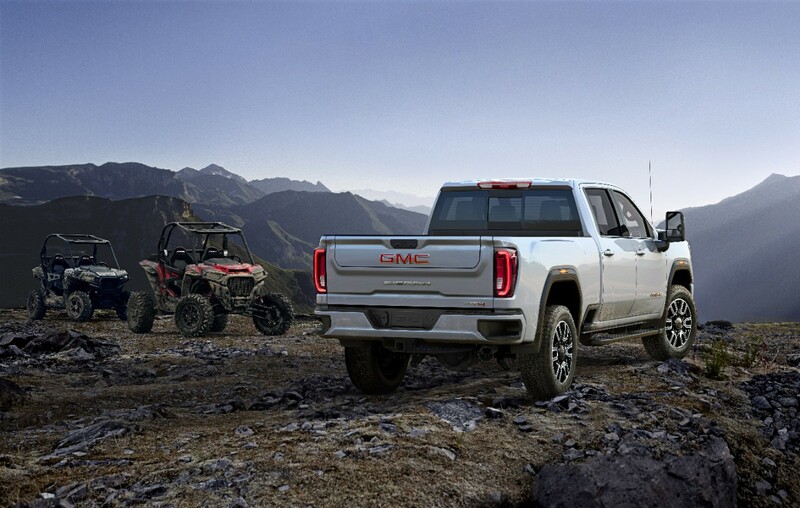 If you want slightly less trail prowess but still a respectable price and towing capacity, the Sierra 1500 AT4 and Chevy Trail Boss 1500 will suit your needs. For those who need to haul large trailers or carry big payloads though, the new AT4 HD is the GM truck for you. It will allow you to handle the big tasks, but then access the remote roads we love once you’re done, and what more can you ask of a heavy-duty truck than that? Release dates are set to begin toward the end of Summer 2019. For more information check out the GMC website here. I couldn’t care less about towing capacity. What I want to know is what the payload capacities are for these juiced up trucks. A guy looking for a truck camper is more interested in this number. I’ll bet that 80-foot boat cost almost as much as a Space Shuttle. I sure wish they’d get away from those silly rotating knobs to activate 4X4 – go back to a nice lever (levers) like my ’57 International. Arizona?!?!?! I’ve lived in DFW 30 years and there’s nothing here but work! We travel away every chance we get. Just noticed your move and I can’t wait the 5 more years till retirement! Cheers!